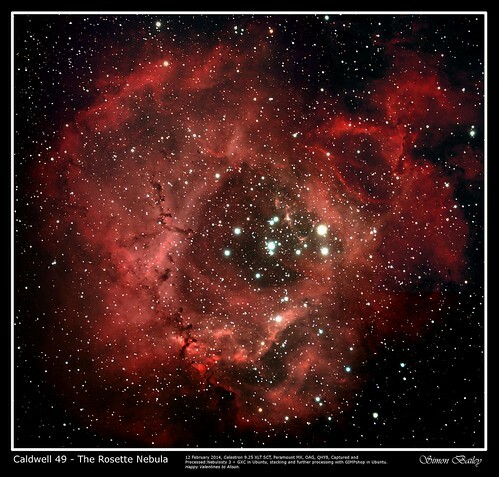 Caldwell 49 , the Rosette Nebula, scaled because the real size TIFF is too large to upload! Celestron 9.25 XLT SCT, taken using Nebulosity3, darks subtracted with GCX in Ubuntu, post processing with Nebulosity 3, stacked and more processing with GIMPshop in Ubuntu. Approximately 30 hours of exposure as a collage. Ready to present to my wife as a rose for Valentine’s Day.